Second hand imports - will Brexit stem or swell tide in 2019? 100,000 imports in sight…. will Brexit stem or swell tide in 2019? New figures hold out the prospect that we will have imported around 100,000 second-hand imports by the time 2018 draws to a close. Unlike new-car registrations that broadly follow the new twice-a-year seasonal pattern, used-import registrations tend to run to around similar volumes month-by-month. Obviously, December is something of an exception, with fewer business days. Yet with 95,148 used imports registered up to the end of November, the 100,000 mark is tantalisingly close. That figure, and indeed higher, has been quoted for some time, but even allowing for that, it is still a phenomenal number. Imports increased by 1.44pc last month (8,732) compared with November 2017 (8,608). That is a marginal difference, but the year-to-date figures show there has been a substantial 8.2pc increase (to 95,148) – up from 87,928 for the first 11 months of 2017. Obviously, such buying is having a negative impact on all used-car values and new-car registrations. Sales of new cars to date are down by 4.4pc to 125,415 – a drop from 131,173. Alan Nolan, director general of the SIMI, said a “challenging and uncertain” trading environment would continue into next year. He stressed there was a fall-off in sales for eight of the 11 months of trading so far this year, with December likely to follow suit. The big question is, will imports continue to grow again next year, or will whatever Brexit deal emerges stem the flood? The words ‘challenging’ and ‘uncertain’ were well chosen to describe the current volatility. Having said that, there are huge numbers of new and revised cars lined up to hit our forecourts next year, so there will be no lack of choice or incentive to buy. 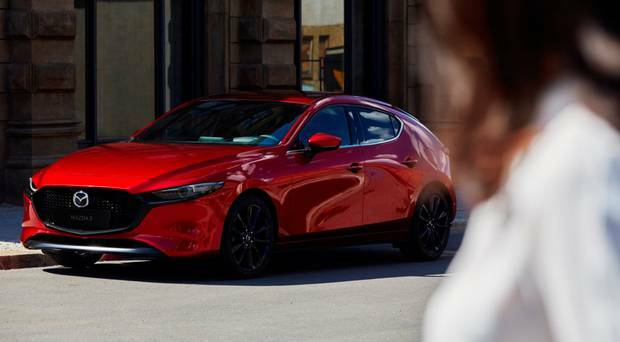 Among them will be the new Mazda3 which was recently unveiled (pictured). I think it looks wonderful. I’m not alone apparently. Mazda here says there has been a huge response to their new hatch and saloon. The new car gets here in time for 192 registration. Expect the hatch first, in April, but the saloon version won’t be too far behind, Mazda tells me.